The pattern of seasonal conditions at the end of October 2018 is highly complex across NSW. While rainfall has bought relief in many areas, particularly to the east, it has come as storms and there is currently a high degree of variability between and within regions. The overview below provides a general description only, and it is important to note there is significant variation in on-ground conditions at present. This is particularly evident in the transition zones between the areas in the east, where rainfall has recharged soil moisture stores and provided opportunity for production, to the inner and the far west where rainfall has been minimal and ineffective for production. Rainfall events in early to mid-October 2018 have seen a significant easing of drought intensity in eastern parts of NSW. There are strong signs of agronomic recovery in these regions, with sustained pasture growth along the coast and hinterland, parts of the Central Tablelands, Northern Tablelands and eastern Hunter. However, while there has been a spring growth response, the underlying soil moisture has not significantly recharged in all areas. 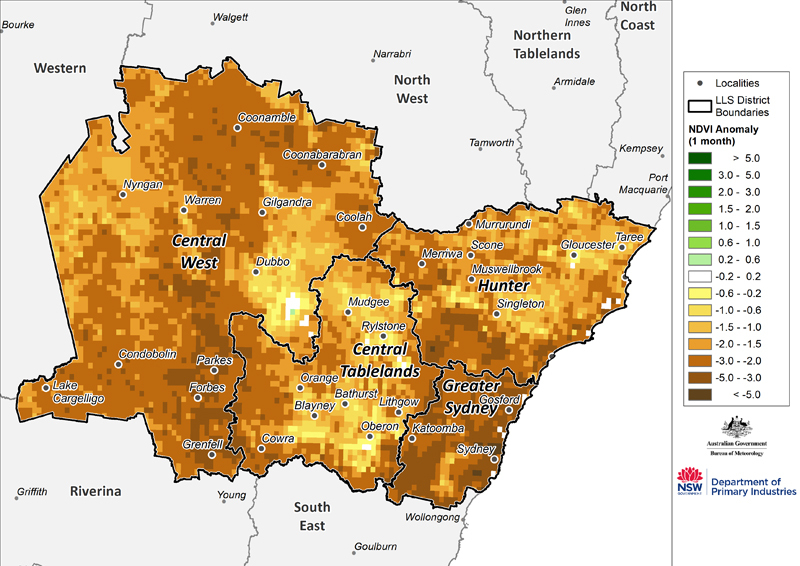 This, along with the consideration of conditions over the last 12 months, means that these areas remain in the Drought or Drought Affected category, according to the Combined Drought Indicator. 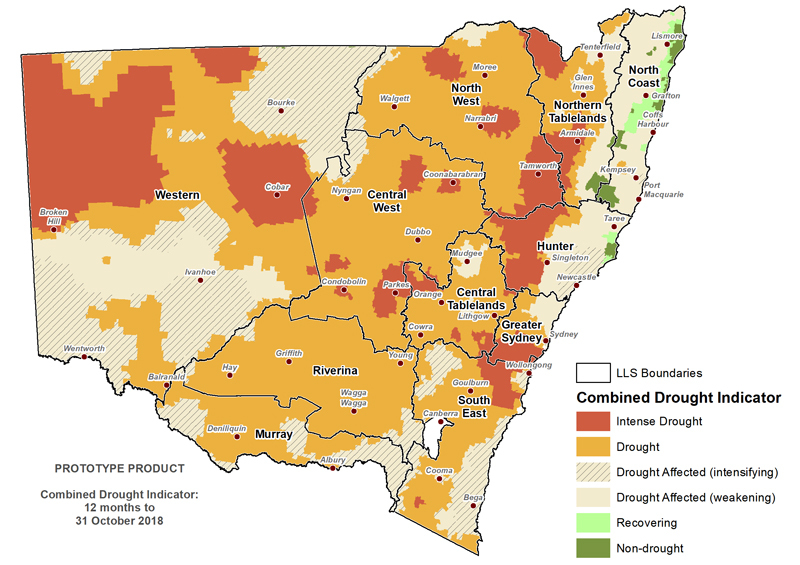 While there has been an improvement in seasonal conditions in parts of eastern NSW, the majority of the state remains under more intense drought conditions. While some rainfall has fallen, it has been ineffective in terms of a return to production, and drought management continues unchanged. There are areas to the west of the Central West, North West and Western region where this means a further continuation of their livestock feeding program and no cropping option. DPI, in collaboration with Geoscience Australia, have undertaken the first ever comprehensive audit of farm dam levels across NSW. Although this remains a prototype methodology, it highlights that large parts of NSW have dam water surface area in the lowest 20% of capacity (relative to the highest level recorded since January 2000). 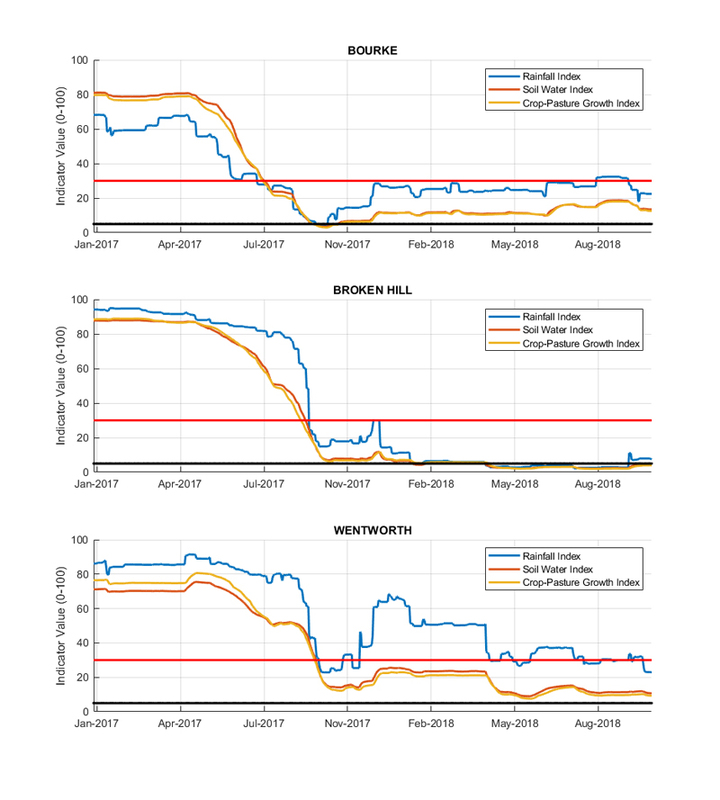 Considering the prospect of increasing evaporative losses in the coming months, DPI’s assessment is that surface stock water supplies are currently critically low across much of NSW. There isn’t a strong signal from major climate drivers at the end of October 2018, although based on climate models the odds of an El Niño forming in the remainder of the year remain moderate to high. For farmers in NSW, this is likely to mean a continuation of the storm rainfall patterns that underpin the complex on-ground conditions. As the state moves towards summer, the most likely forward scenario is for the drought to continue in many regions, but with significant regional and farm-to-farm variability, and heightened risk of ‘false breaks’ occurring. The latest estimates of drought intensity at the end of October place up to 30%* of the state as Drought Affected, 50%* in Drought and 19%* in Intense Drought. Much of the North Coast is now in the Non-Drought category, with the remainder quickly transitioning out of the Drought Affected category. * Figures are rounded to the nearest whole number as per the standard convention. The official forecast from the Bureau of Meteorology currently indicates that there is a 50% chance of achieving median rainfall over most of the state for the coming forecast period (November-January), with high probability of warm conditions. Both daytime and overnight temperatures are predicted to be warmer than average. There is a 70% chance of an El Niño occurring in 2018, and it appears likely that a positive Indian Ocean Dipole is underway, though it is predicted to break down by summer. Both of these climate influences are likely to exacerbate rainfall deficiencies in southeast Australia. 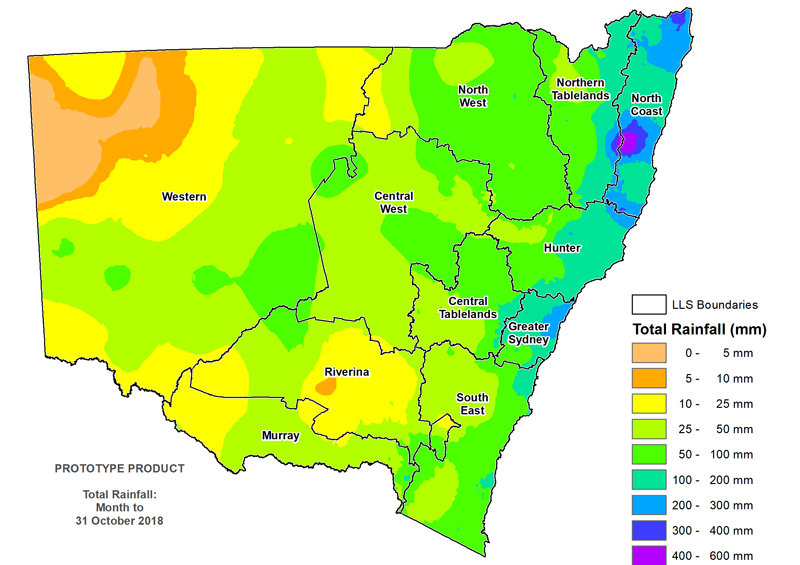 Rainfall was generally average to above average across the majority of NSW, however areas to the north of Broken Hill and north of Albury through to Young experienced below to very much below average rainfall. Rainfall totals (Figure 2) ranged from above 100mm in the mid to north east of NSW, with the highest falls inland of Kempsey. 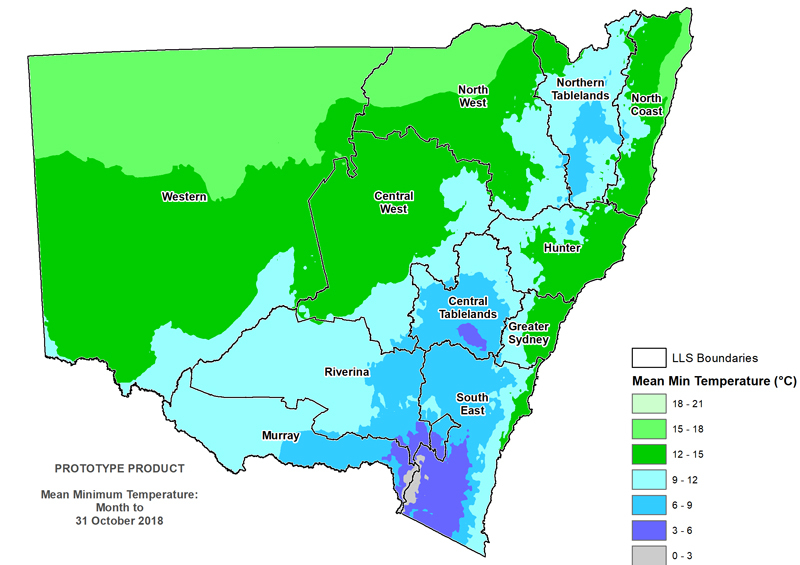 The rest of NSW generally received falls of between 10-100mm, while the far west and north west of NSW received falls of below 10mm. 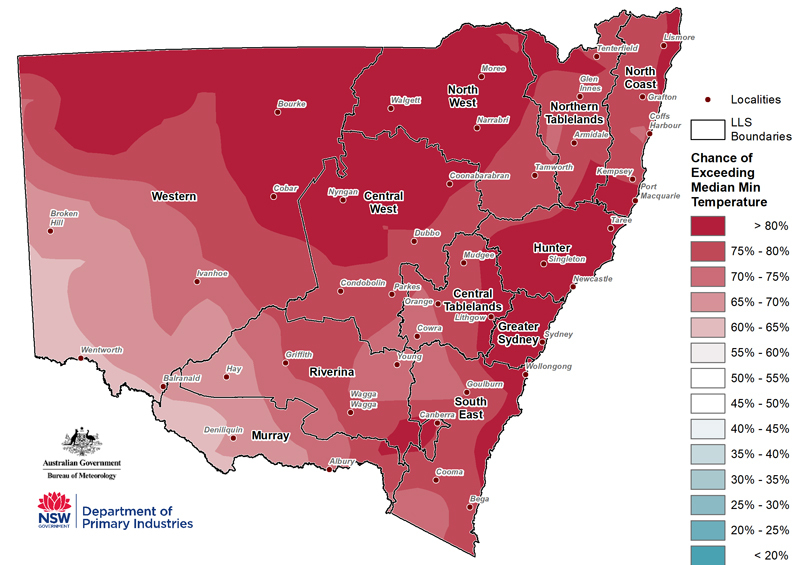 The majority of NSW experienced above average to very much above average daytime temperatures during October, except for eastern parts of the state which experienced average to below average daytime temperatures (Figure 3). Daytime temperatures ranged between 15-30°C, except for the alpine regions which ranged between 9-15°C. Overnight temperatures were above average to very much above average across NSW and ranged between 6-18°C, except in the alpine regions which ranged between 0-6°C (Figure 4). The monthly NDVI anomaly (Figure 5) indicates lower than normal greenness extended across much of NSW during October. Some areas in northeast NSW have seen considerable improvement in the NDVI anomaly this month, while regions in the southeast have declined. The NDVI anomaly data for October sees a continuation of the field conditions that have been affecting NSW for the last 6-12 months, where plant conditions that are poorer than seasonal expectations. Stock water levels remain critically low across large parts of NSW, as indicated by the farm dam surface area assessment in Figure 6. Critically low areas can be identified in most LLS regions, but the most extensive areas of concern cover much of the Western, North West and Central West. There are also large areas of concern in the Murray and Riverina, reflecting the intensification of drought event detected by the CDI during October. The assessment is a collaboration between DPI and Geoscience Australia’s Digital Earth Australia Program, and is the first ever widespread audit of farm dam conditions in NSW. A new methodology was applied which uses high resolution remote sensing to: detect and map all water bodies (including farm dams) in the size range 3125 m2 – 10 km2; exclude storages that are potentially part of irrigation schemes or river reaches; and compare the current water surface area in each dam to the maximum extents for the period 2000 – present. 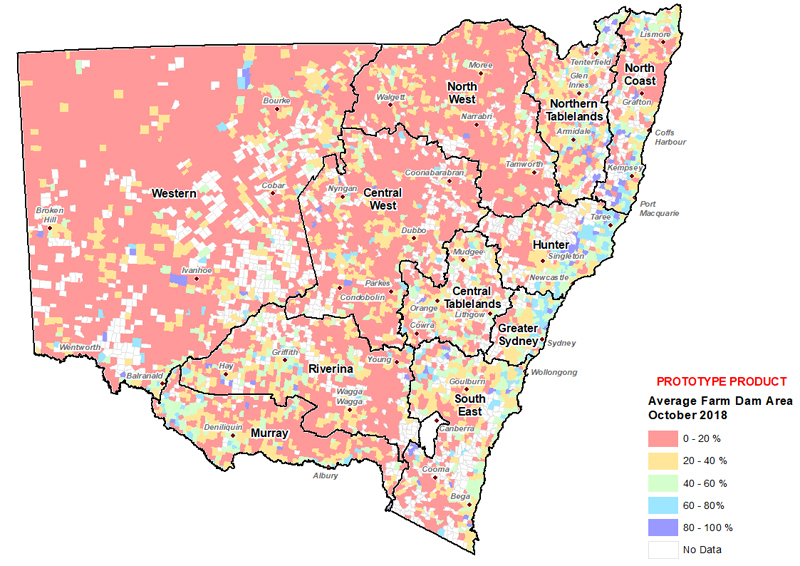 Area calculations were undertaken for 47,000 individual water bodies across NSW and aggregated to the parish level for reporting (Figure 6). The methodology and resulting map in Figure 6 are a prototype, and there needs to be more comprehensive field verification as well as further refinements to the techniques of farm dam detection and exclusion of irrigation storages. The work has been presented in this month’s State Seasonal Update because of the continuing drought and concerns about stock water status leading into summer. The data also provides a means of verifying the drought indices, with a comprehensive data source that is independent of the meteorological network. No extreme events were recorded during October 2018. 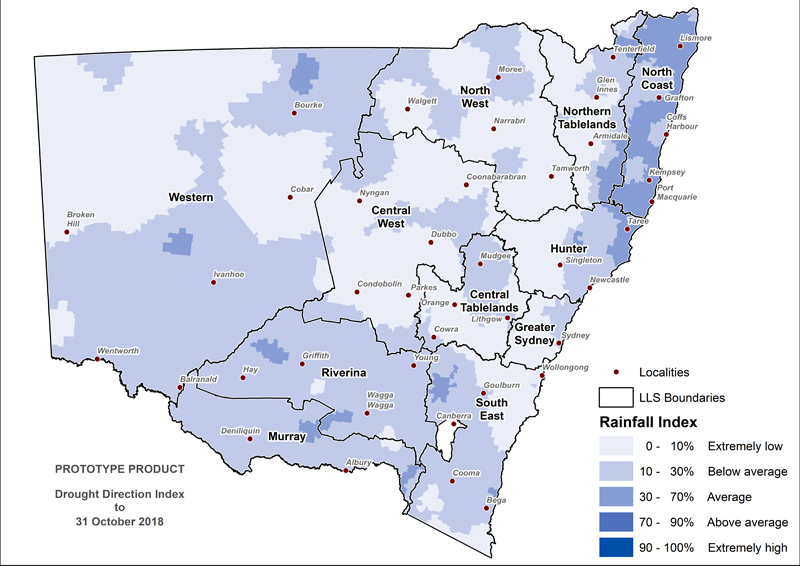 The Rainfall Index (RI, Figure 7) shows that the majority of NSW continues to be experiencing below average to extremely low rainfall. Parts of the North Coast Local Land Services region are currently at average levels and this is reflected in the Combined Drought Indicator and reported on-ground conditions. 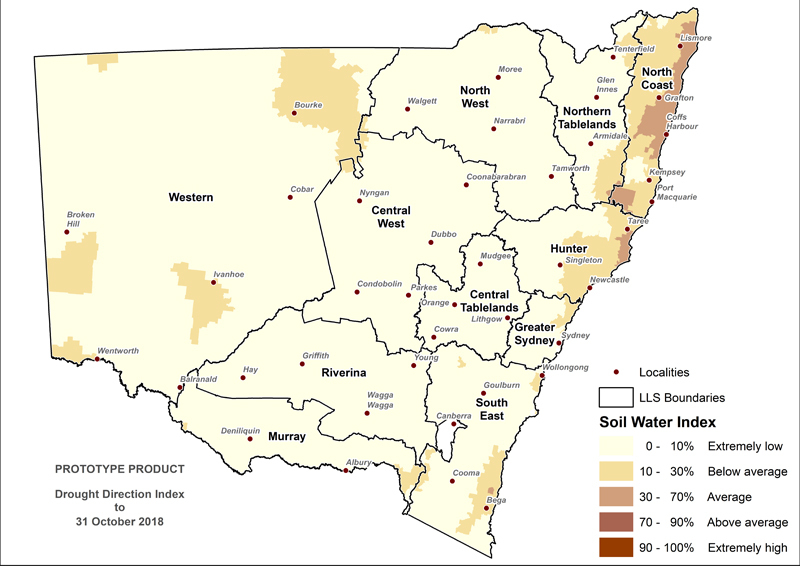 The Soil Water Index (SWI, Figure 8) shows that the majority of NSW has stored soil moisture at extremely low levels, when considering conditions over a twelve month window. Some improvement in the North Coast and Hunter Local Land Services regions is evident, where the SWI is now at an average level. The Plant Growth Index (PGI, Figure 9) is still extremely low across most of NSW and largely mirrors the Soil Water Index (SWI). Some improvement is evident along the North Coast Local Land Service region coastline, where the PGI is currently average. The SWI and PGI are key indicators of the agronomic drought that is currently being experienced across NSW, and provide a closer estimate of visual field conditions than the Rainfall Index at this stage of the drought event. 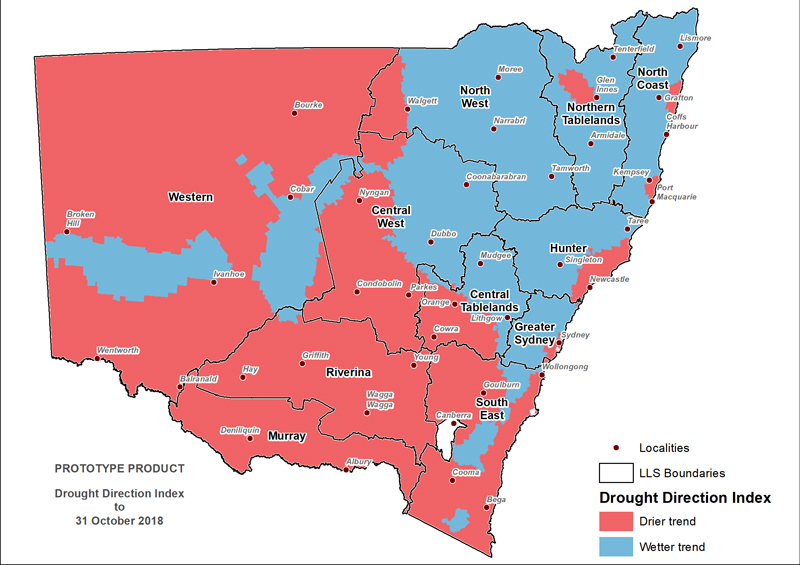 The Drought Direction Index (DDI, Figure 10) indicates that the areas experiencing a positive trend (drought becoming less intense or improving conditions) has expanded across central and north-eastern NSW since the September State Seasonal Update. Ongoing falls of rain are need to ensure conditions improve in these areas. 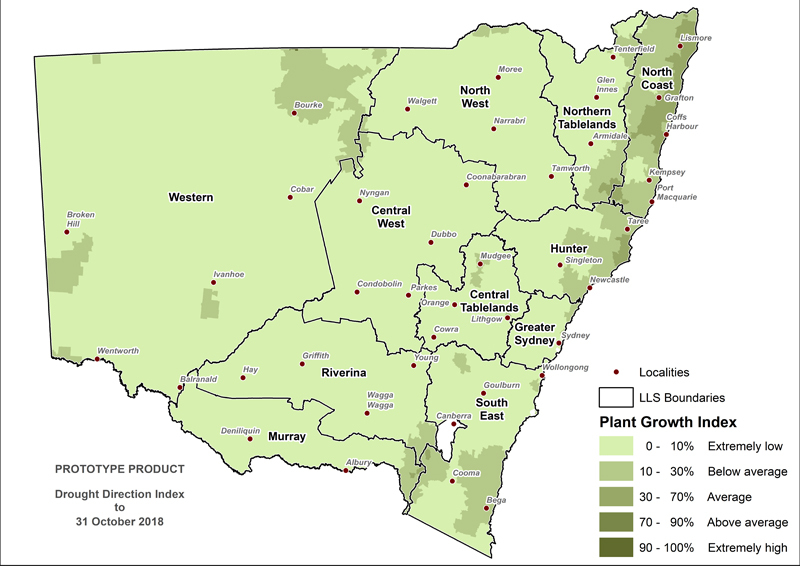 A number of field observations have been taken by farmers and the community during September and October 2018, with an even distribution across central inland NSW (Figure 11). Further observations have been provided in the far west during October. For the most part, these provide a degree of corroboration for the CDI mapping, where reports of severe and very severe drought made in the field correspond to the areas mapped in Drought and Intense Drought. 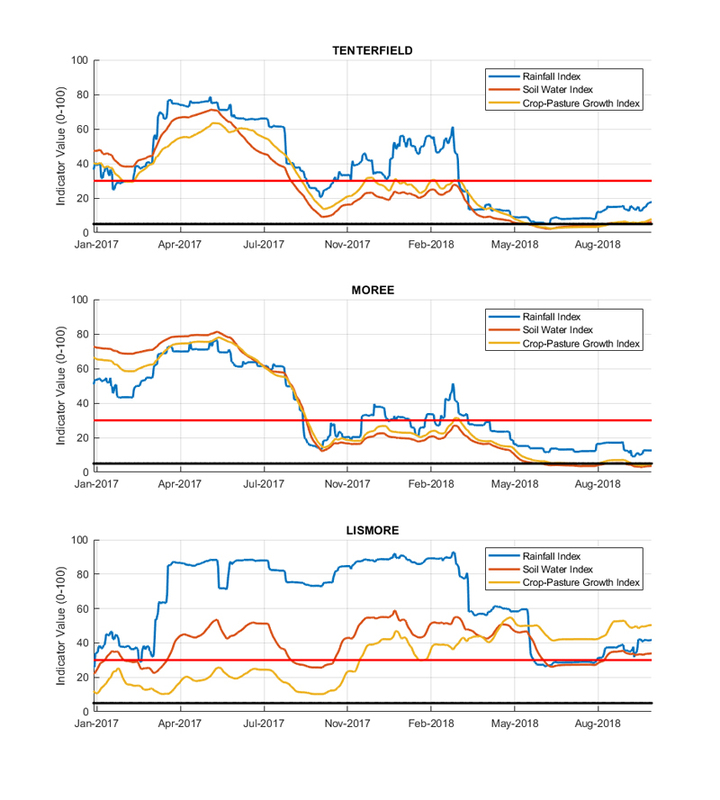 An observation to the west of Tamworth has a producer evaluating conditions as severe drought, whereas the CDI is in a less severe category (Drought Affected). 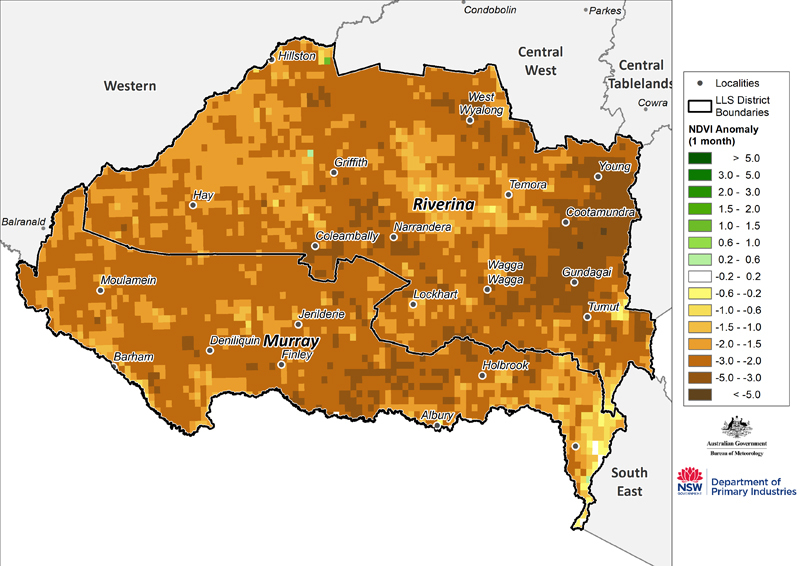 North-west of Wagga has a producer assessed conditions as Moderate, whereas the CDI places the region in the Drought category. 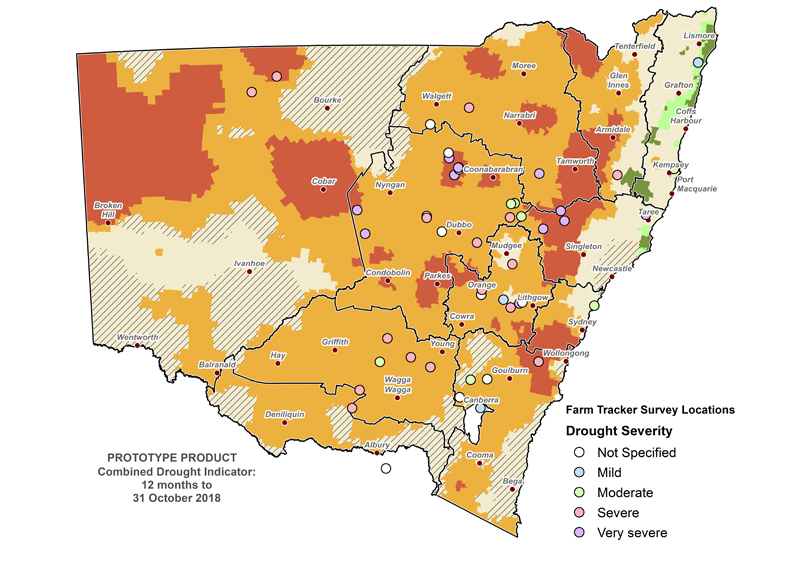 An area near Mudgee in NSW where a producer reported severe drought at the start of October, but by the end of October the CDI was in the less intense category of Drought Affected. The observations are made available through a new application called NSWDPI FarmTracker™, which currently has a small user (testing) group of 60. 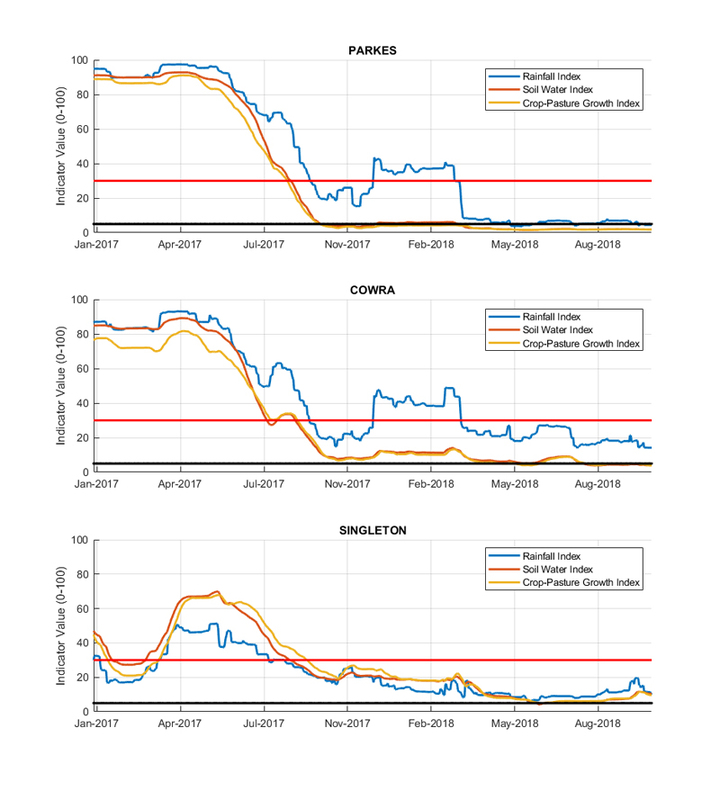 As more users and observations become available, an in-depth verification of the drought indicators will be possible in future State Seasonal Updates. Figure 12 displays the CDI status for each individual Local Land Services region to 31 October 2018. 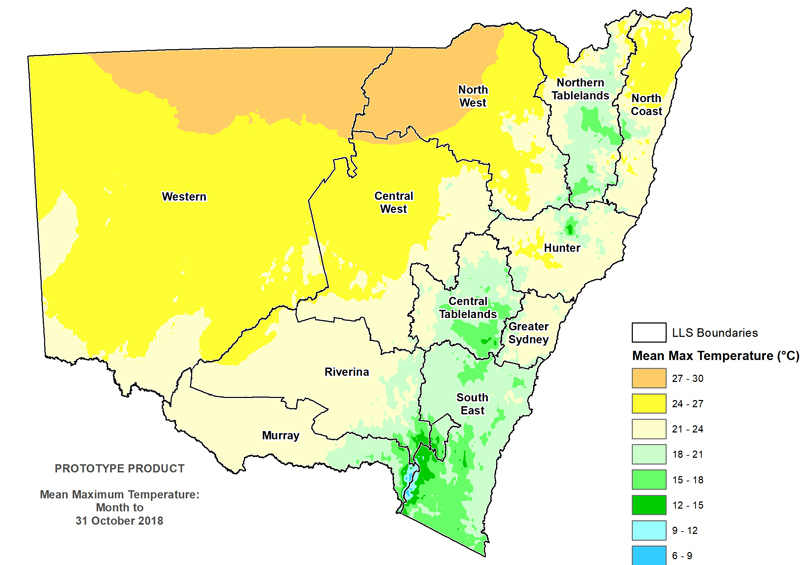 Information from the Combined Drought Indicator (CDI; Figure 13) shows that the entire region remains in either the Drought or Drought Affected categories and the area in Drought has expanded since the last State Seasonal Update. Areas that did experience some recovery during September, which was driven by isolated rainfall events, have transition back into Drought Affected. The monthly NDVI anomaly data (Figure 14) indicates significant variation across the region with the majority of the area experiencing below normal levels of greenness. The eastern parts of Murray and Riverina LLS region that were reported to be showing signs of improved pasture condition in the September State Seasonal Update, have seen a decline in condition over the past month and have these areas of improved pasture condition have retracted to the alpine zone of the Murray LLS region. 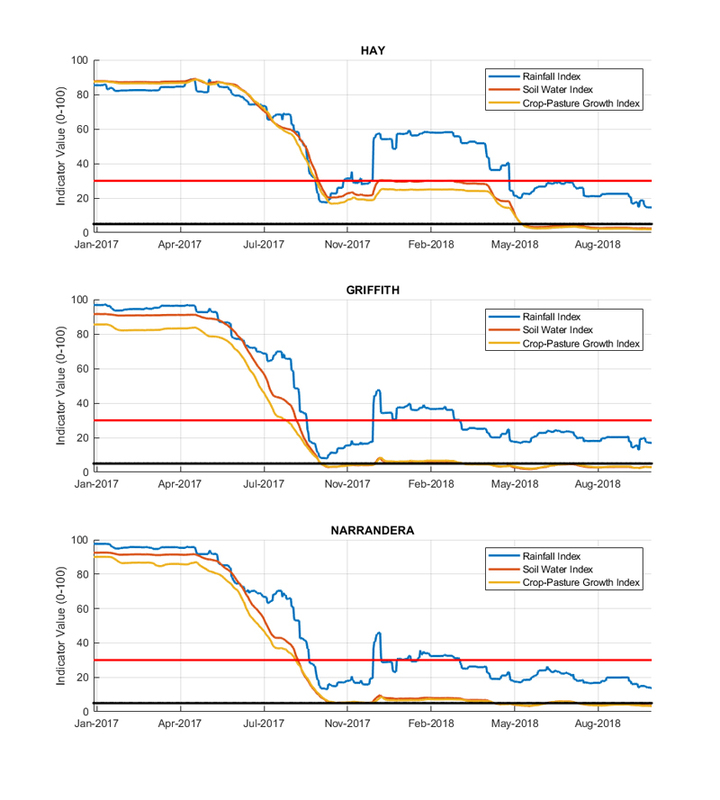 The Western Local Land Services (LLS) region continues to experience drought conditions with only very minimal improvements in the south of the region over the past month (Figure 16). 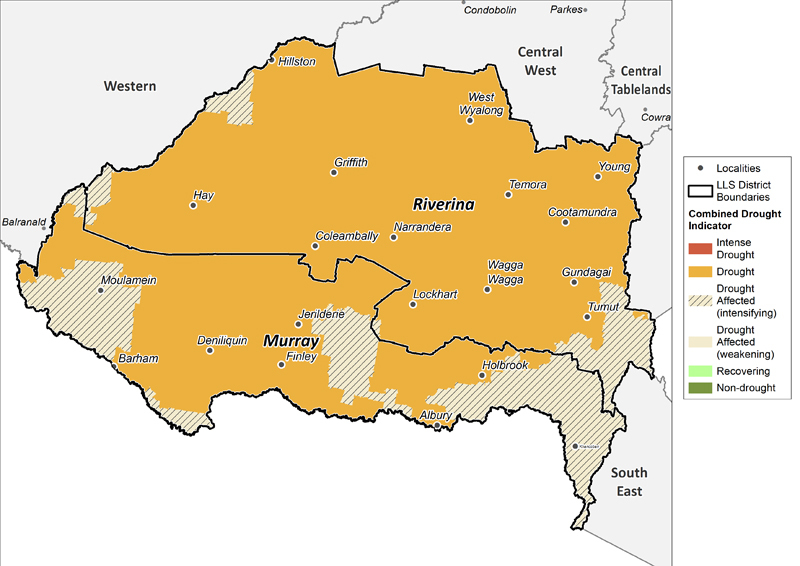 Areas in the Intense Drought category have expanded and include the region from Broken Hill and north to Tibooburra and to the east and north of Wilcannia, the greater Cobar region and to the north-east of Wanaaring. In the south of the Western LLS region, many areas that were reported in Drought in the September State Seasonal Update have now transition to Drought Affected. There has been minimal follow up rainfall in the region south of Broken Hill which received a significant rainfall event in late September. The available NDVI data and EDIS data suggests only minimal pasture growth response to this event. The effectiveness of rainfall for production is influenced by a number of factors including preceding conditions as well as total grazing pressure. Available field reports suggest that there has been an influx of grazing herbivores into the region but this is difficult to quantify. The monthly NDVI anomaly (Figure 17) data indicates little change in plant conditions in the northwest of the Western LLS. Areas in the south of the Western LLS have seen the most improvement, particularly between Menindee and Ivanhoe, but this area remains below the historical average for this time of year. 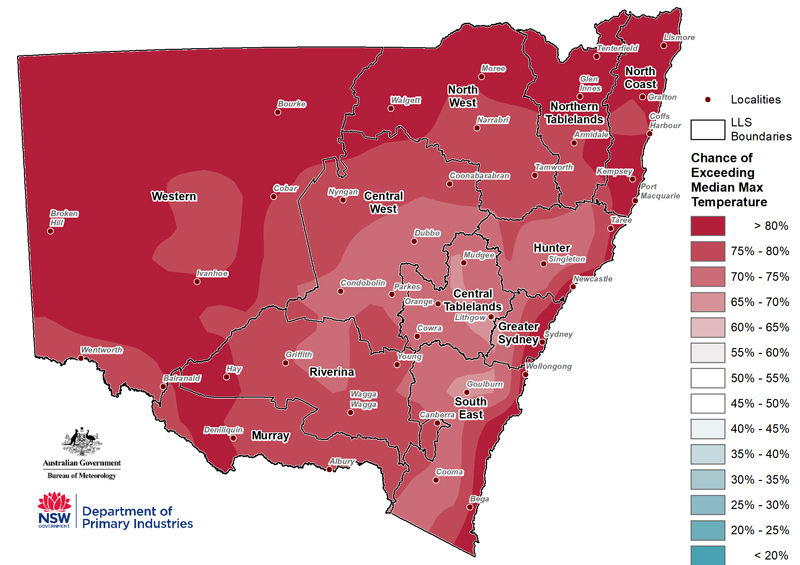 Information from the Combined Drought Indicator (CDI; Figure 19) shows that the majority of the area remains in one of the three drought categories of Drought Affected, Drought or Intense Drought. 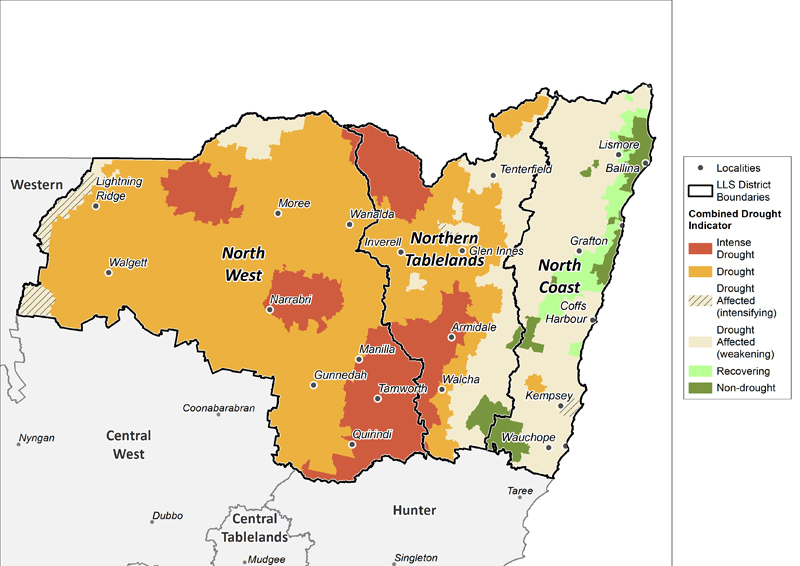 Since the September Sate Seasonal Update, conditions in the North West and Northern Tablelands LLS regions have deteriorated with the majority of the region in the Drought or Intense Drought categories. 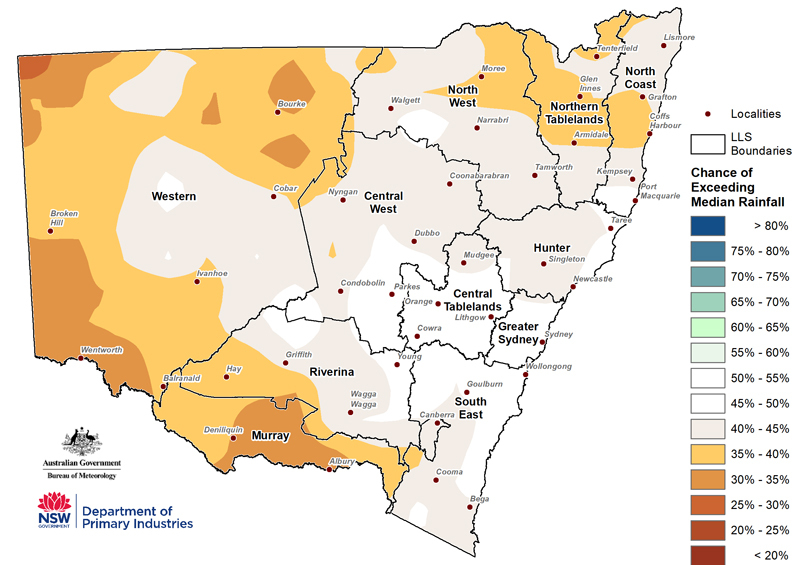 Intense Drought remains for areas around Tamworth, Quirindi, and Narrabri, and to the east of Collarenebri. Intense Drought has also expanded into the regions between Boggabilla and Ashford, between Armidale and Guyra and to the south of Bundarra. The North Coast LLS regions continues to experience high spatial variability in the drought categories, with parts along the coastal fringe remaining in Non-Drought or Recovering while other areas of the region remaining in the Drought Affected category. 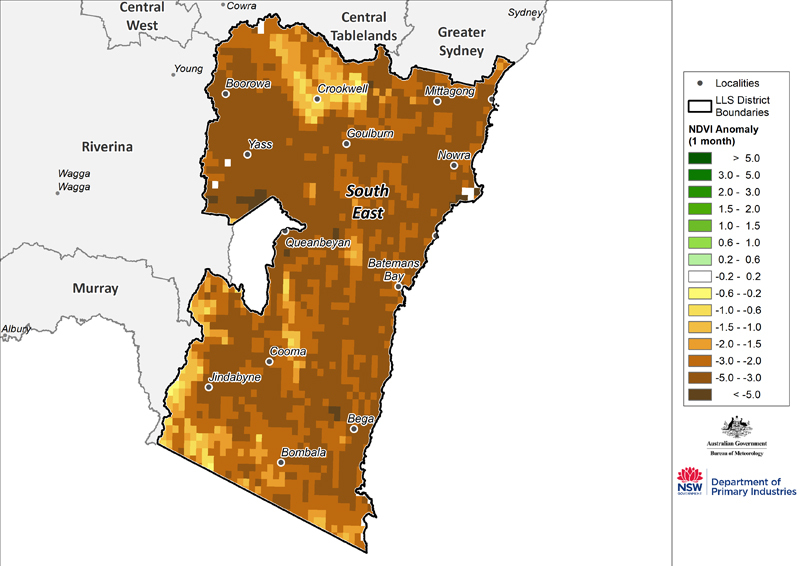 The NDVI anomaly data (Figure 20) shows substantial improvements across the northeast of NSW, particularly in the eastern parts of the North West, and all of the Northern Tablelands and North Coast. Greening in this region is a response to several successive rainfall events during October. 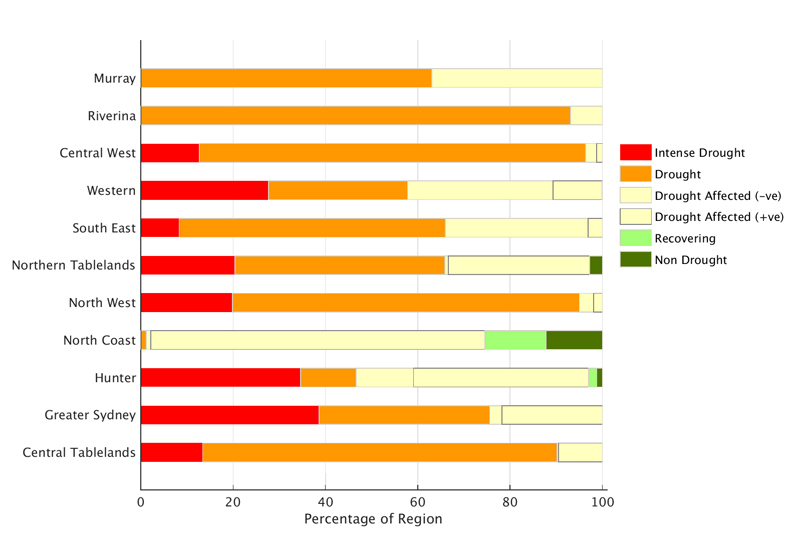 Information from the Combined Drought Indicator (CDI; Figure 22) shows that the majority of the regions remains in one of the three drought categories of Drought Affected, Drought or Intense Drought. 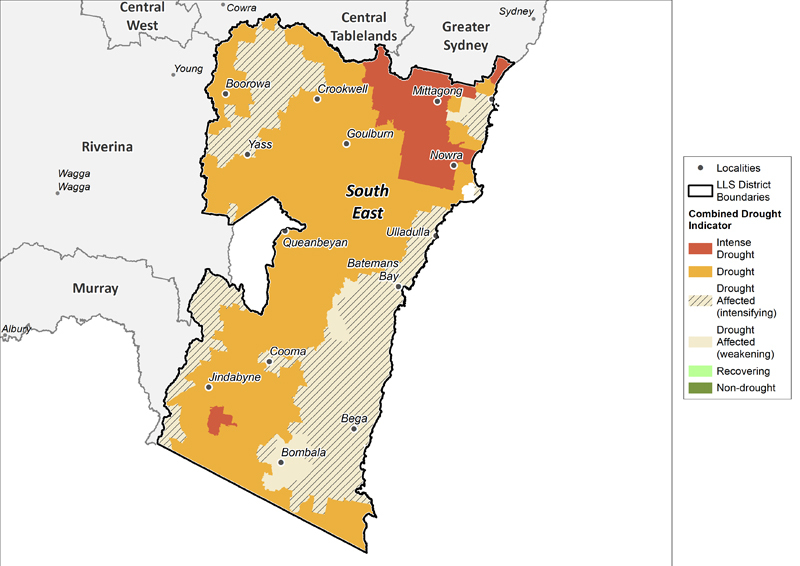 The Greater Sydney LLS regions has seen some improvement since the September State Seasonal Update, with areas bordering the eastern parts of the Blue Mountains transitioning out of Intense Drought and into Drought. The Hunter LLS regions remains relatively unchanged though the area around Forster continues to recover and is either in the Non Drought or Recovering categories. 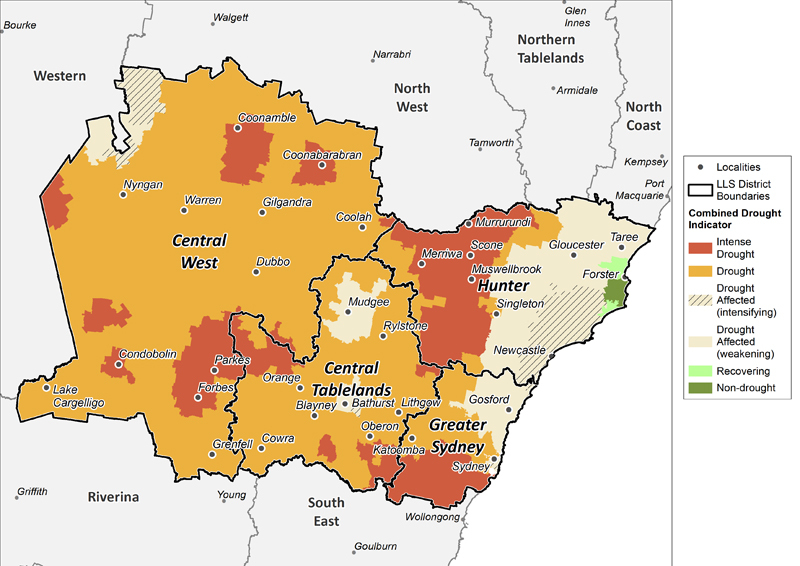 Intense Drought has expanded into the Central Tablelands and Central West LLS regions. 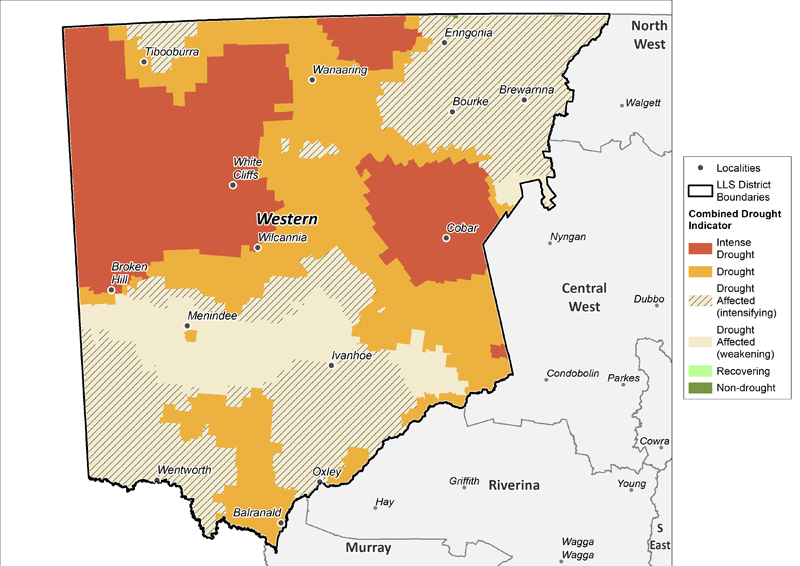 Areas currently recorded as being in the most severe category of Intense Drought include the Molong, Parkes, Forbes and Peak Hill regions, to the south of Oberon, along with the Condobolin, Coonabarabran, Coonamble and Gulargambone regions. 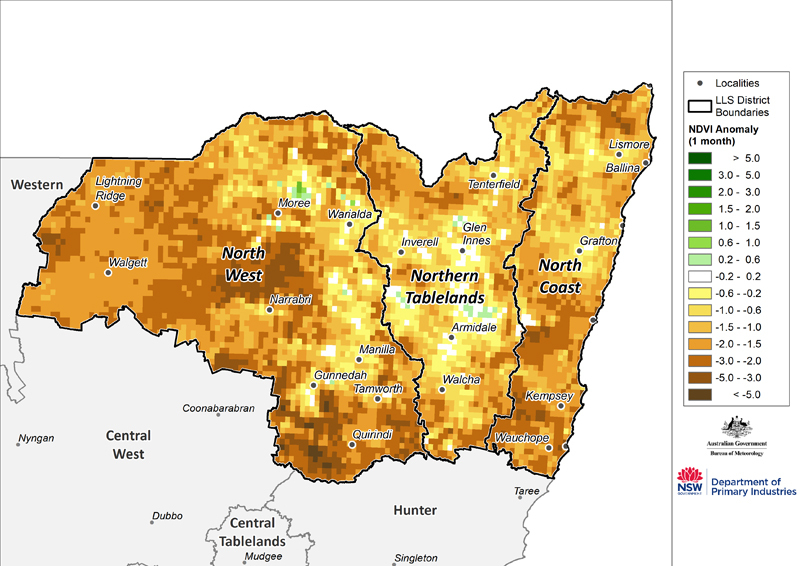 The NDVI anomaly data (Figure 23) shows substantial improvement in the Central Tablelands, in the Central West between Molong and Dubbo, and in the Hunter, however these anomalies are still below the historical average for this time of year. The Greater Sydney LLS has shown a slight decline in conditions. Information from the Combined Drought Indicator (CDI; Figure 25) shows that the area in the three drought categories remains relatively unchanged since the September State Seasonal Update was released, with the entire region remaining in either the Drought Affected, Drought or Intense Drought categories. Areas along the coastal fringe that were identified in the last update as being in recovery or Non Drought, has now transitioned back into the Drought Affected category. Despite moderate falls of rain during October in the South East LLS, the NDVI anomaly (Figure 26) showed a substantial decline in plant conditions from the previous month. The official national climate outlook for November to January was issued by the Bureau of Meteorology on 25 October 2018. The outlook shows that large parts of Australia are likely to be drier than average over the next three months, however eastern NSW and the northern tropics have a near equal chance of being drier or wetter than average. November to January daytime temperature have an increased likelihood of being warmer than average across most of Australia. Overnight temperatures also have an increased likelihood of being warmer than average across Australia, except for the southeast of Western Australia, southern South Australia and western Victoria which have a near equal chance of cooler or warmer overnight temperatures. For New South Wales, the rainfall outlook (Figure 28) for November to January indicates that there is a near equal chance (40-60% probability) of wetter or drier than average conditions across most of NSW over the next three months. 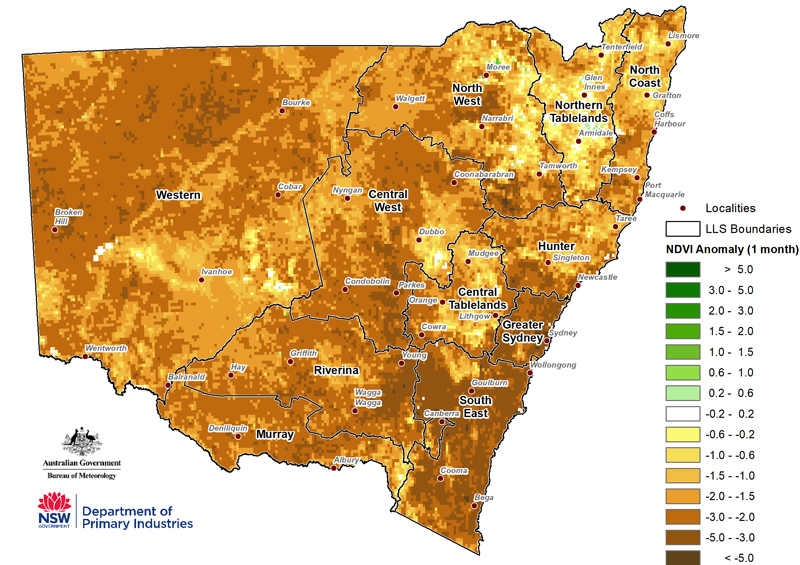 The exceptions are parts of western, southern and northern NSW which have an increased chance (between 65-75%) of drier than normal conditions. The temperature outlook (Figures 29 & 30) indicates that there is an increased chance of warmer than average daytime and overnight temperatures across NSW. The majority of the state has greater than a 65% chance of warmer than average daytime temperatures and 60% chance of warmer than average overnight temperatures. The forecast maps in Figures 29-31 are based on a new forecasting system released by the BoM in September 2018, called ACCESS-S. 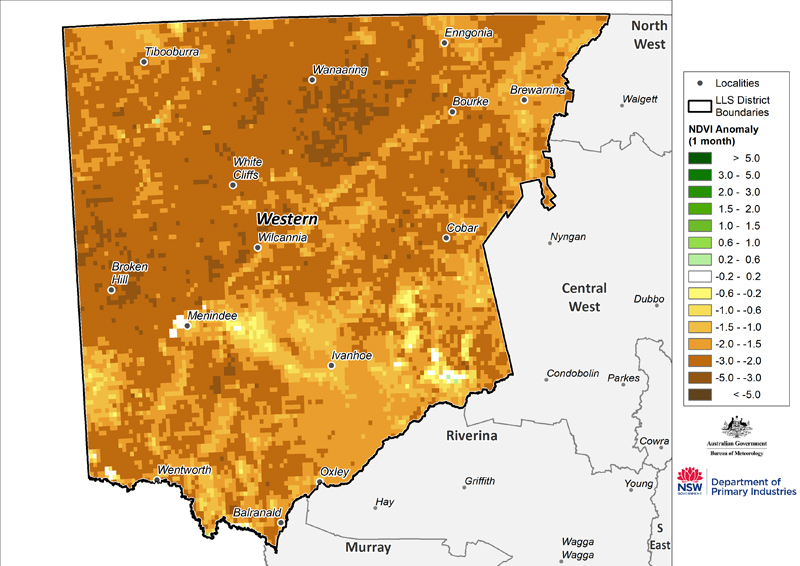 This provides an improved spatial resolution in forecasting across the state, as well as improvements in the underlying circulation models and data assimilation scheme. As of 23 October 2018, the Bureau of Meteorology’s ENSO Outlook remains at El Niño Alert, with a 70% chance of El Niño developing in the remainder of 2018. Six of the eights models predict that El Niño thresholds will be met or exceeded in November. Cloud levels at the junction of the equator and the International Date Line have remained below average during October. Whilst below average cloud levels is usually indicative of La Niño, the overall pattern of cloud levels across the Pacific has been more consistent with a neutral ENSO. Trade Winds are currently near average across the tropical Pacific (as of 21 October 2018). Generally during an El Niño there is a sustained weakening of trade winds across much of the tropical Pacific. Monthly sea surface temperatures anomalies (SST) for October (Figure 32) were slightly warmer than average across the equatorial Pacific Ocean, but still within neutral ENSO range. Anomalously warm sea surface temperatures are affecting parts of the South and North Pacific. The September values for NINO3 were +0.3°C, NINO3.4 +0.3°C and NINO4 +0.6°C. Sub-surface temperatures (Figure 33) shows that warm anomalies in the sub-surface have increased significantly when compared to the September temperatures. 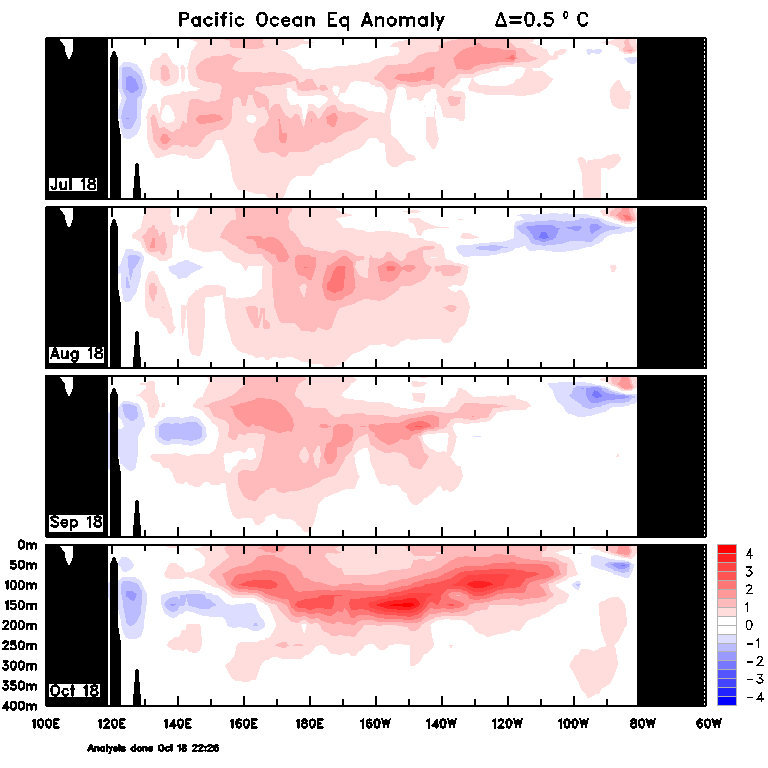 A large pool of anomalously warm water extends across the sub-surface of the equatorial Pacific, with parts being more than 3°C warmer than average. The Indian Ocean Dipole (IOD) is currently slightly positive (+0.45°C as of 21 October 2018). Positive values need to persist until at least November for 2018 to be considered a positive IOD year. All six international climate models surveyed by the Bureau of Meteorology predict that the positive IOD will breakdown during November, which is the typical seasonal pattern of the IOD. 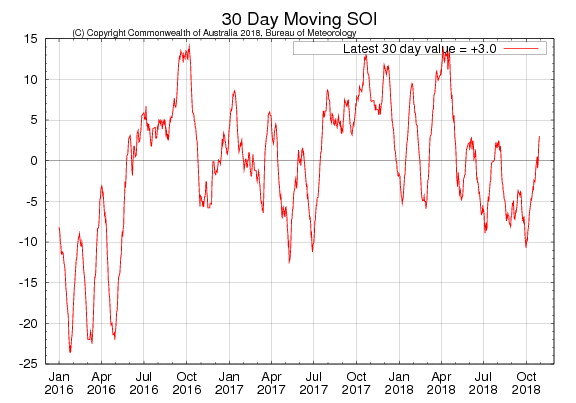 The IOD typically has little influence on Australian climate from December to April. The Southern Annular Mode (SAM) is currently near neutral and is expected to remain neutral to weakly negative in the first half of November. A negative SAM during summer typically creates high pressure over southern Australia and suppresses rainfall. Information used in this report was primarily sourced from the Australian Bureau of Meteorology, the US National Oceanic and Atmospheric Administration, the International Research Institute for Climate and Society (Columbia University), Geoscience Australia’s Digital Earth Australia Program, and NSW Department of Primary Industries. Disclaimer: The information contained in this publication is based on knowledge and understanding at the time of writing (November 2018). However, because of advances in knowledge, users are reminded of the need to ensure that information upon which they rely is up to date and to check currency of the information with the appropriate officer of the Department of Primary Industries or the user’s independent adviser.